With an epic troll voice performed by the equally epic Chris Lindsay of Wizards of the Coast, the "Troll battle" SoundSet makes for a truly memorable encounter indeed. 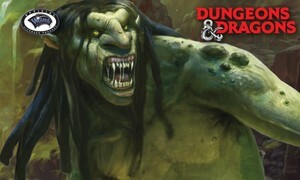 Hefty roars, punctuated by stone crushing blows and the cries of hapless PCs being thrown across the room, plus Syrinscape's 'huge' Dragon Heist adventure music soundtrack this SoundSet makes an encounter with a troll so much more than just the whittling down of something with pesky regen. Create atmosphere, create tension, create excitement, create chaos! Born with horrific appetites, trolls eat anything they can catch and devour. They have no society to speak of, but they do serve as mercenaries to orcs, ogres, ettins, hags, and giants. As payment, trolls demand food and treasure. Trolls are difficult to control, however, doing as they please even when working with more powerful creatures. Art provided by Wizards of the Coast LLC.